Three girls and a car packed to the max hit the road in San Luis Obispo at 7:00 a.m. on Friday morning. Spirits were high and excited regardless of running on about five hours of sleep each. Bikram Yoga Santa Barbara was the first stop to energize our sleepy bones. A lovely little studio just off the 101 was just what we needed. The teacher was energetic and pushed us just the right way. Lunch at a local vegan restaurant (it was delicious) and a little shopping at Drishti Yoga shop was the perfect after Bikram treat. Back on the road to Los Angeles we went. The next morning we were up by 7:00 preparing for the Pacific Pole Championships where we had a Mika Booth set-up. The day was busy with selling, watching amazing Pole Dancers compete, meeting people from numerous places around the world and many laughs. Strong, beautiful, talented, amazing women filled the competition. We were thrilled to see various competitors wearing Mika Sparkle outfits! So grateful and appreciative of our Mika supporters and lovers out there! Thank you everyone! Sayaha Aida, studio owner of Studio Boton in SF, placed 3rd in the Artistic Level 3 division! Faith Jay Daniels, one of our Mika spokesmodels was a judge at the event! Sadly, Sunday, we had to pack up and hit the road again, but not before a stop in Manhattan Beach! We visited Bikram Yoga Manhattan Beach, an adorable studio in the heart of Manhattan Beach. The studio was equipped with giant framed chalkboards showcasing their scheduling, challenges and quotes. While practicing, a big window made it possible to see surfers, beach goers, and volleyball players making their way to the sandy shoals. Also, we were able to practice and talk with Michelle Kwan, yes, the Olympic Gold Medal Figure Skater! She was as beautiful as ever and very, very sweet. We joined all those beach goers we saw walking by and headed down to the beach ourselves after our hot, wonderful class. It was the perfect, peaceful ending to our non-stop busy weekend. We were excited to see all the Pole Competitors, the different studios and the various girls wearing Mika every place we went! We look forward to more Mika work trips, studio hopping and people meeting. While traveling, we decided it is both fun and significant to keep health in the forefront. It's so easy to eat bad without exercising. We felt so good this weekend; despite lacking sleep, we were energized and ready for anything. 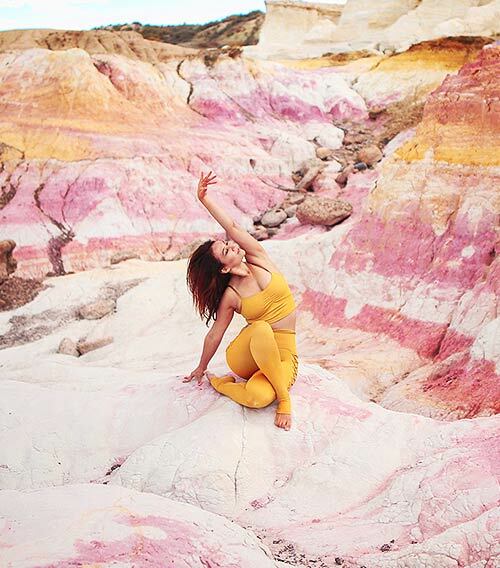 Knowing it was from all the Bikram Yoga we did, we are wondering what you find vital during your travels to keep you feeling healthy and vigorous.Please share with us your favorite implementations for staying active while traveling!